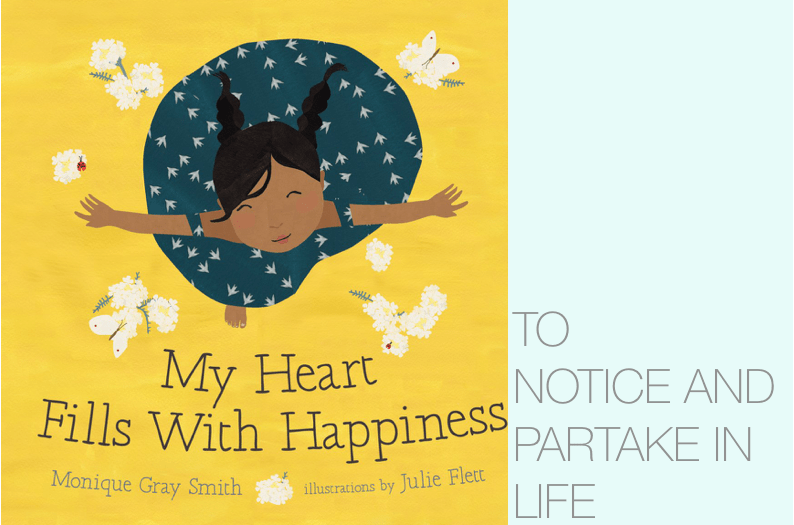 julie flett’s picture book life + giveaway! I’m so delighted to feature Julie Flett here! She is a Cree-Metis artist, illustrator, and author from Canada, creating some of the most beautiful children’s books ever. Her art is so distinctive—the play of smooth solids and patterns, of muted tones and vibrant accents of color, all with ever present clean lines, bold shapes, and collage. 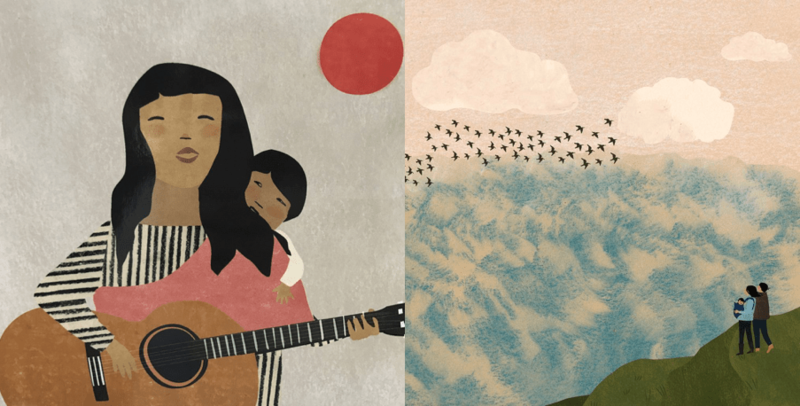 Her projects explore and celebrate Native people and include themes of history, family bonds, culture, and nature. You know when you’re holding one of her books in your hands—her illustrations communicate so much feeling and connection to others and the world around us. Each one truly tells a story. 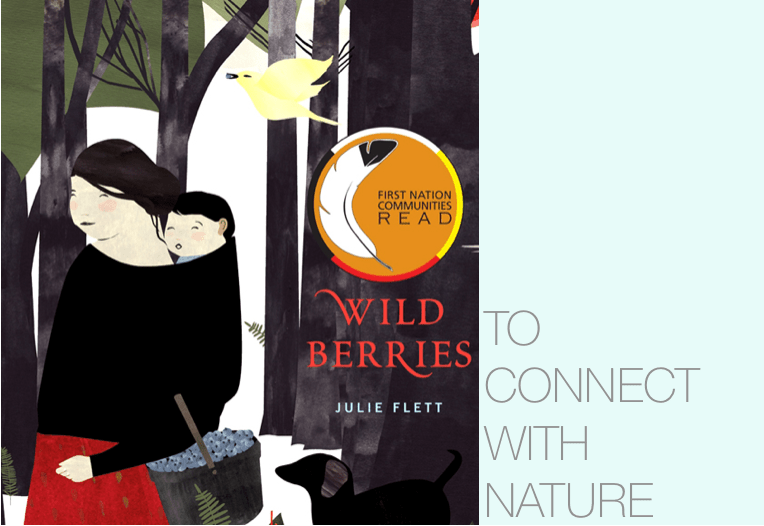 Julie Flett wrote and illustrated this one in which a boy and his grandmother pick blueberries in the woods. This book is filled with small, still, contemplative moments and details as well as bilingual vocabulary from the Cree language. Plus, there’s a recipe for wild blueberry jam at the back. Little You, written by Richard Van Camp (2013). A lullaby to a little one, bursting with love and joy. I’m interested in the everyday experience, in the intimacy of my subject matter. For Little You, I thought a lot about my son as a baby and toddler. The page with the hole in the mother’s sock reads, “Let’s all dance, let’s all sing,” and the image for this page came to me right away. I often played music for my son when he was a baby and we would dance around the kitchen or living room together. My Heart Fills With Happiness, written by Monique Gray Smith (2016). This book fills my heart with happiness and is a wonderful exploration of the connective and special while simple things in life, incorporating elements of Native culture. Beautiful. As an adult, I attended art school at Concordia University, where my major was studio art. The work I was producing at that time was installation based, painting, sound, and some film work. After graduating, I worked as an advocate and outreach worker in the Downtown Eastside of Vancouver. During that period, my sister, who worked for First Nations publisher Theytus Books, asked me if I’d like to illustrate a book. They were looking for an illustrator for a children’s story and asked me to submit draft drawings. It all happened so quickly that I didn’t have much of a chance to really think about not having experience as an illustrator. I discovered a love for this. 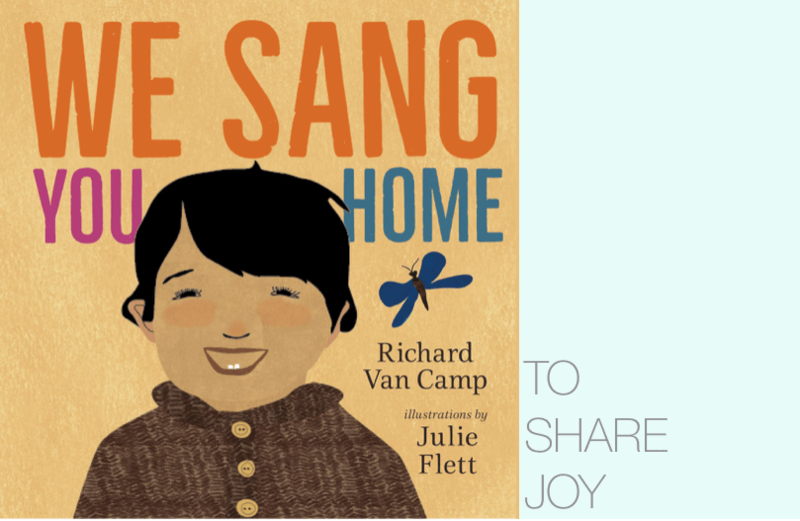 We Sang You Home, written by Richard Van Camp (2016). My mom was a textile artist. She had a weaving shop when we were growing up, in the 1970s, and later a consignment-clothing store with a focus on vintage clothing from the ’20s and ’30s. I was around textiles a lot as a child. My sister and I used to spin wool for the weaving shop, and I developed a love for patterns, dyes, and materials. I think I approach the collage work similarly to composing a haiku. My collage imagery is often pared down, emphasizing simplicity, intensity, and direct expression. I’m also inspired by painters, filmmakers, and children’s bookmakers from earlier periods. I especially like Ezra Jack Keats, Eric Carle, artist Sonia Delaunay, Inuit print-maker Pitseolak Ashoona, and filmmaker Andrei Tarkovsky, to name a few. When We Were Alone, written by David A. Robertson (2016). 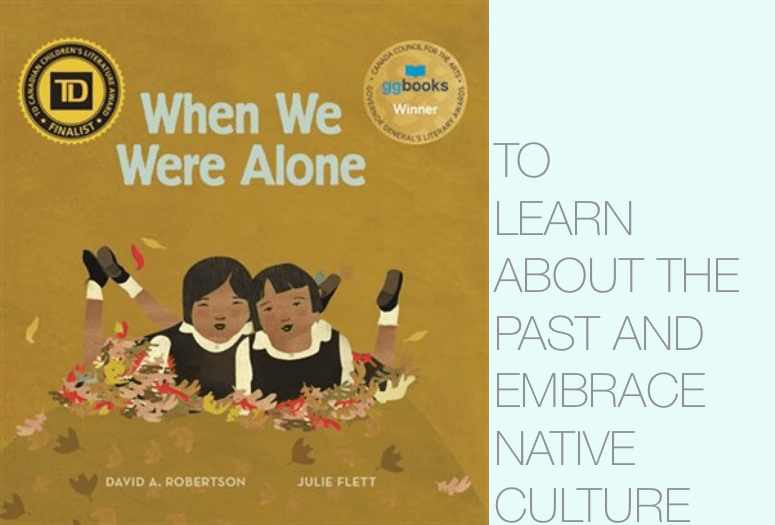 Without mentioning them outright, this book takes on the topic of Canadian residential schools in which Indigenous children were sent away to government facilities in order to assimilate into Canadian/European/English or French-speaking culture. “In all, about 150,000 First Nation, Inuit and Métis children were removed from their communities and forced to attend the schools.” The conditions were terrible, and the children were isolated from their families, cultures, and languages for most or all of the year. 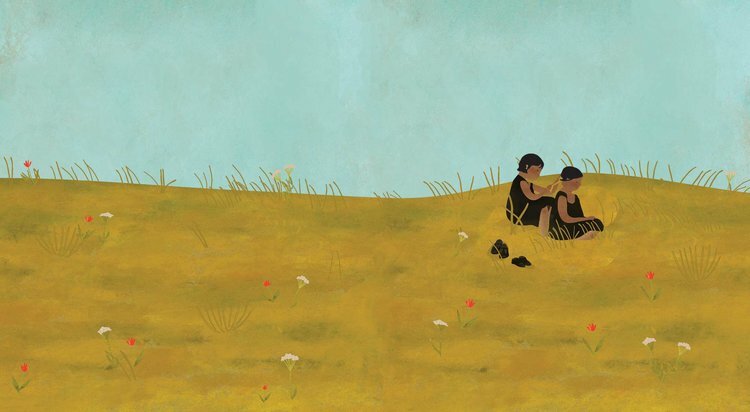 In this story, a child asks her grandmother a series of questions about her daily life and practices—her bright clothes, her long braid, her Cree words that “sounded just like a poem.” The answers illuminate the injustice of her grandmother’s past as well as the way she then and now strives to reclaim her heritage, pride, and self, courageously and poignantly. It’s an eye-opening, sad, and important book that’s perfectly crafted in a way for young readers to engage with. Here’s an article that includes quotes from Julie Flett about the process of creating When We Were Alone. Admittedly, I haven’t been able to get a copy of this one to read myself, but wanted to include it because it’s another book Julie Flett has written as well. 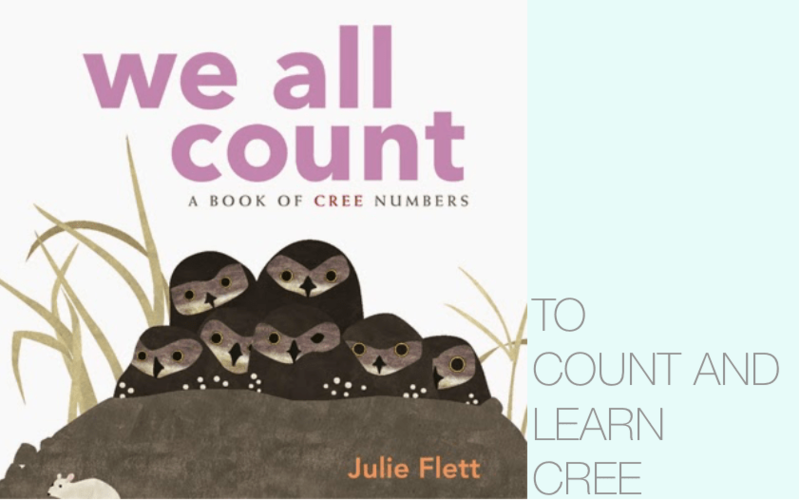 A counting book that’s gorgeously illustrated and helps kids not only count, but learn the Cree language. Win, win, win. 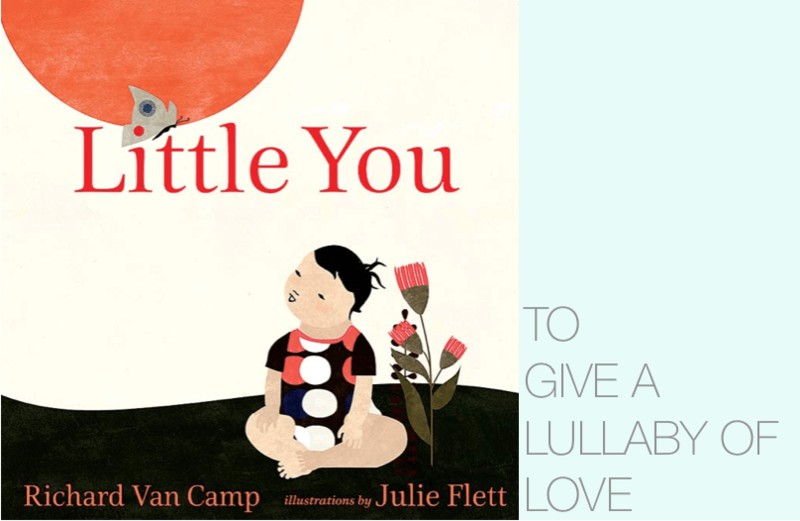 7 Responses to julie flett’s picture book life + giveaway! I adore having art from all of Julie’s books collected in one convenient, easy-to-savor post! Plus quotes and interviews? This is outstanding! Thank for for connecting me to more resources from this uber-talented, marvelously creative artist. Her work is stunning! I love the depth of her work. I have read quite a few of these and I recognized the illustrations at once! In BC, we have a lot of Indigenous authors and illustrators represented at our local libraries. I’m going to look into the When We Were Alone book because I haven’t seen that one before.